A magic trick is a good start to differentiate science from magic and the 3 Cup Monty looks like magic but is truly scientific. Gasps of amazement are assured if we demonstrate Elephant’s toothpaste as it keeps spilling out and spilling out filling the table with foam. Balloons are always fun but extra fun with Rocket Balloons, Spinning Balloons and Helicopter balloons.Our balloon kebabs are always a tasty experiment and blink and you will miss it with our wonderful flash paper. 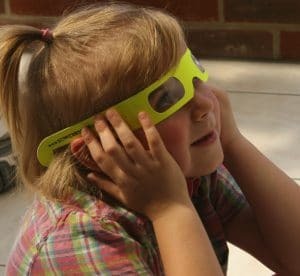 Squidy is considered “a must” for most younger children. Good things can come in small packages and this may start with a head spinning Tornado Tube and the mind puzzling 3 Cup Monty. 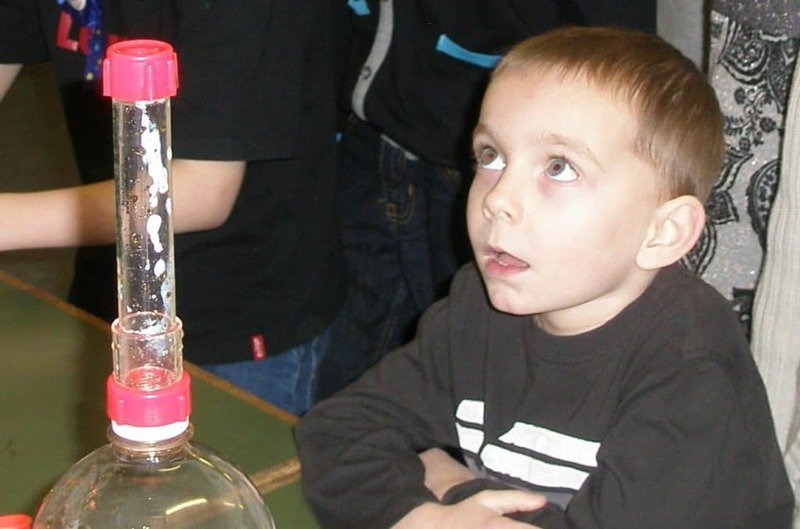 Whatever the weather we can make snow in the children’s hands and hopefully they will marvel at the wonders of Squidy, our own Cartesian diver. Thinking of living creatures, we love to make Elephant’s toothpaste and if we can get outside, a coke and mentos geyser is a must. A must for older children where they may see balloons that self-inflate or the use of CO2 as a fire extinguisher. 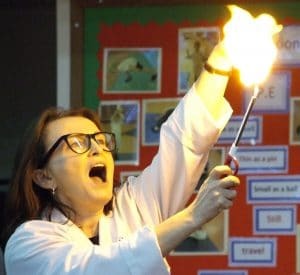 Tasting the gas and dry ice burps are part of the fun as are dry ice bubbles and the extra loud pop that one gets with a Film Canister rocket but we save until last the spooky scene where everyone sits on the floor as the white mist swirls all around them. There are many other possible experiments, too numerable to mention all here. All this and they will also understand the different nature of solids and gasses. A must for older children where they may see balloons that self-inflate or the use of CO2 as a fire extinguisher. 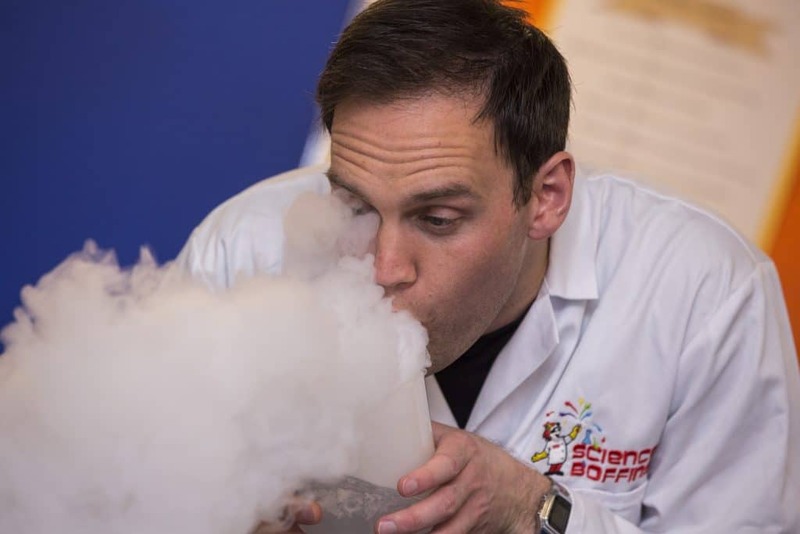 Tasting the gas and dry ice burps are part of the fun as are dry ice bubbles and the extra loud pop that one gets with a Film Canister rocket but we save until last the spooky scene where everyone sits on the floor as the white mist swirls all around them. There are many other possible experiments, too numerable to mention all here. All this and they will also understand the different nature of solids and gasses. This is an additional chance to try ice cream made with dry ice or else we might use smoothies or even Slush. 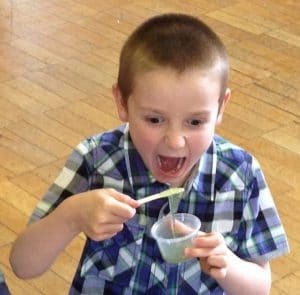 Young party guests can learn about polymers and take home their own pots of personally mixed ghastly green, putrid pink or rancid red sticky slime. Of course, it’s all washable with soap and water and definitely non-toxic. The three states of matter seem an unlikely starting point for a popcorn explosion but there will be a lot of munching going on. To follow this, three uninspiring powders will be served to everyone and when mixed the children find they have lemon sherbet to eat there and then or to take home. 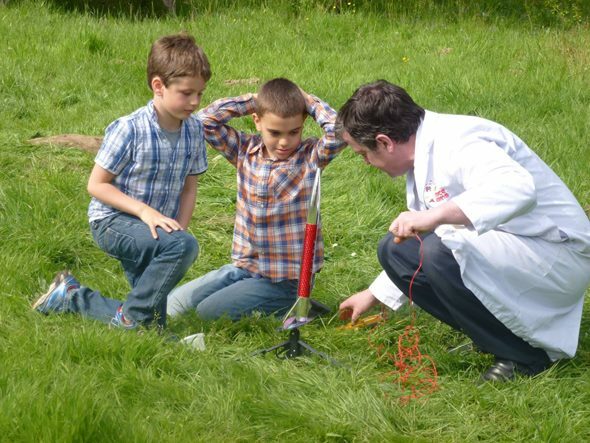 Our rockets are replicas of the real thing with a solid fuel motor that may climb hundreds of feet in the air before deploying a parachute or ribbon and floating gently down to earth. If floating down to earth involves meeting trees on the way we will launch our Lunar Module to replace the rocket so even if you have a restricted area we should still be good for BLAST OFF! The birthday boy or girl has the honour of controlling the launch pad and presses the buttons after an exciting countdown. Slime is carried as a standby in case of rain or other emergencies.